After a two-year process, the institute’s National Commission on Social, Emotional and Academic Development outlines a series of “conditions to enable good practice." In 1983, the "Nation at Risk" report pointed to widespread underachievement in U.S. schools and warned that a “rising tide of mediocrity” would compromise America’s ability to have a competitive workforce. On Tuesday, the Aspen Institute’s National Commission on Social, Emotional and Academic Development released its culminating report, calling the U.S. a “nation at hope” that better understands how social and emotional development contributes to learning and later success. “Our nation’s economy and the nature of work are changing, and businesses today need employees who can work well with others, express their ideas clearly, and persevere when they face challenges,” Jorge L. Benitez, co-chair of the commission, said in a news release. The former CEO of Accenture North America, Benitez is among the leaders from the business, education, research, policy and military sectors serving on the commission. Over the past two years, they have learned from scientists, educators, parents and youth about how social and emotional development each interact with academics, and they reject the idea that relating to others, showing empathy or persevering toward a goal are considered “soft” skills. Greenberg and commission member Roger Weissberg of the University of Illinois at Chicago also authored a recently released report on social-emotional learning (SEL) from the Robert Wood Johnson Foundation, which Greenberg said is a complement to the commission’s report, but also focuses on SEL in out-of-school settings and in early childhood. On a policy level, the commission members write that the Every Student Succeeds Act (ESSA) presents an opportunity for school leaders, parents and teachers to implement approaches that best fit their communities. “Devolution creates an obligation on the part of adults to use their influence in creative, effective ways to serve every student,” they write. At a time when the nation has focused on making schools safer and preventing more shootings, the authors also note that one “critical prevention strategy against school violence” is making sure students feel like they belong in school and are both physically and emotionally safe. The report notes a review of more than 200 studies concluded that more supportive school environments are associated with less bullying and other aggressive behaviors. 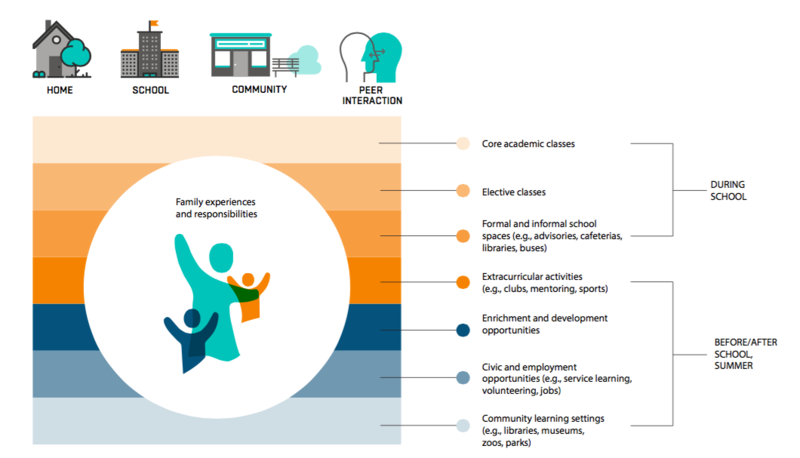 Calling them the “conditions to enable good practice,” the report’s recommendations include examples of how educators and school leaders can create more comprehensive approaches to education – among them, weaving social and emotional skills into practices throughout the school day, such as during recess, in the hallways and during lunch. The authors highlight a seminar class program at Damonte Ranch High School in Washoe County, Nevada, and expeditions for 7th graders at King Middle School in Portland, Maine, as examples of how local schools and communities are taking a more “whole-child” approach. Another example is the Andover (Massachusetts) Public Schools’ “sprint teams” — a model in which a group of principals, assistant principals, special education coordinators and other district-level administrators work together over a short period of time on key initiatives. The teams have taken on projects, such as implementing the Responsive Classroom approach and creating committees to respond to issues of racism or discrimination. A graphic in the report displays the variety of settings in which students learn. In addition to drawing attention to what schools are already doing, the authors also stress that the broader community, including youth development organizations, after-school programs, mental health agencies and other social service providers have a role in addressing students’ social, emotional and academic development as part of their programs and to identify issues such as food insecurity, substance use and other issues that interfere with learning.